Dr. Robert Endres leads the biological physics group with its strength in the quantitative understanding of sensing and signalling, and the physics of life network. He also designed and introduced the Masters programme in systems and synthetic biology, and is highly involved in training undergraduate students in systems biology. Systems biology, information processing, biological physics, cell mechanics (summary pdf). Maksym Romenskyy was awarded a Marie Curie fellowship to work on social behaviour of C. elegans nematodes, in particular on how genes map to behaviour (2/2019). In collaboration with Andre Brown at Hammersmith campus. Awarded Imperial 'Physics of Life' network of excellence which I will co-lead with Chris Dunsby from physics and Chiu Fan Lee from bioengineering (1/2019). Accepted manuscript in Biophysical Journal (letter) entitled "Drift and behavior of E. coli cells", with G. Micali, R. Colin, and V. Sourjik (MPI Marburg). In press in Rep. Prog. Phys. : "How cells engulf: a review of theoretical approaches to phagocytosis" with D.M. Richards (Exeter). Accepted manuscript in PLoS Biology entitled "A critical-like collective state leads to long-range cell communication in Dictyostelium discoideum aggregation", with Giovanna De Palo and Darvin Yi (Stanford). Accepted manuscript in eLife entitled "Cell wall remodeling drives engulfment during Bacillus subtilis sporulation", with Javier Lopez-Garrido and Kit Pogliano (UCSD). Linus Schumacher joined group in April 2016. For his PhD work at Oxford University he won the Reinhart Heinrich Doctoral Thesis Award in Mathematical Modelling and Theoretical Biology. 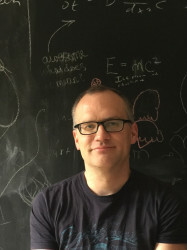 Before starting at Imperial College in 2007 as Senior Lecturer, Robert was a postdoc with Prof. Ned Wingreen in the Molecular Biology Department at Princeton University, where his main research accomplishments were the understanding of the remarkable signalling properties of bacterial chemotaxis and the atomistic prediction of protein-DNA binding sites. In 2002 he obtained a PhD in physics from the University of California at Davis. His work, conducted in the group of Prof. Daniel Cox, dealt with charge transfer in biomolecules, in particular in DNA. In 1999 he obtained a Masters physics from the University of Goettingen in Germany, where he worked in the group of Prof. Kurt Schoenhammer on highly correlated electronic systems. In 1996/1997 he also spent an academic year at the University of California at Santa Cruz. Figure: Schematic of a bacterial cell illustrating the high degree of organization. As an example, chemotaxis receptors get inserted into the inner membrane and localize at t he cell poles, where receptors f orm signalling complexes leading to remarkable signall ing properties. The underlying biop hysical and cell-regulatory mechanisms for recept or clustering are still largely unknown. Conference "Information, Probability and Inference in Systems Biology", Edinburgh, UK, July 15-17, 2013. Seminar, Cavendish Laboratory, University of Cambridge, November 23, 2012. Seminar, Department of Mathematics and Statistics, University of Reading, October 31, 2012. GEM4 summer school "Cellular and Molecular Mechanics", Imperial College, September 14, 2012. Conference "Physics Meets Biology", University of Oxford, September 3-5, 2012. Colloqium, CeNS, Ludwig-Maximilians University, Munich, Germany, June 29, 2012. Seminar, Department of Physics, University of Bayreuth, Germany, June 6, 2012.